The Rotarian Action Group for Peace is an action-driven group of Rotarians, Rotarians’ spouses and Rotaractors working together for the purpose of advancing peace and preventing wars throughout the world. The Rotarian Action Group for Peace was formed in 2012 as a group of Rotarians, recognized by Rotary International, focused on providing a network and resources to further the peace and conflict resolution work of Rotarians around the globe. The Rotarian Action Group for Peace is an official entity that empowers and supports the peace work of Rotarians by offering structure, guidance and resources to further their peace efforts. Rotary International has a very strong commitment to peace efforts around the world. One of the objectives of The Rotarian Action Group for Peace is to forge a path for existing Rotary peace programs, such as the Rotary Peace Fellows, to become involved directly with Rotarians and their activities. What is a Rotarian Action Group? A Rotarian Action Group (RAG) is an autonomous, international group, recognized by Rotary International, with a passion for a particular type of service. Rotarian Action Groups provide assistance and support to Rotary clubs and districts in planning and implementing service projects in their respective areas of expertise. During the past few months Rotary International introduced the Positive Peace Academy in conjunction with Rotary strategic partner, the Institute for Economics and Peace. What is the Positive Peace Academy? As described by Laurie Smolenski Outreach and development officer at the Institute for Economics and Peace, and Rotary Foundation alumna, The Rotary Positive Peace Academy is a training course to educate Rotarians on the IEP’s technical research on positive peace. The goal is to help Rotarians use these concepts to improve their peace building and development work in their own communities. The content was created by the IEP, but it has been developed with Rotarians in mind. It includes stories of Rotarians’ projects so Rotarians will be able to recognize themselves and their work as they go through the academy. The back story - over the past few years our club transitioned from a traditional club charted in 1924 to the EClub concept of meeting electronically using various technologies making these types of meetings possible. W have members in India, Mexico, Canada, and several United States. Staying engaged with each other is a challenge sometimes. We continue to do various projects around our hub communities but this does not always satisfy our global members. This past Rotary year we were challenged by Frank 'Alaska' Quinn, our club president, to do self-directed service projects - excellent idea to recognize the service we each do every day but even I, a self-starter all my life, had trouble staying motivated without some interconnection with my club members. Sure I see Rotarians almost everyday but not those from my club. What if each member signed up for the no cost, self-paced course?? It fit in with the direction our club follows - literacy, education, clean water, maternal and child health, helping children at risk. We had a good basis in Peace also with Jaimen McMillan, director of Hands in Peace, an organization active in bringing peace festivals to children around the world and longtime club member. We hope ALL our members will take a look at the videos below describing the Academy and guidelines. AND get as excited as we are. On July 1 I plan to sign up for the Rotary Positive Peace Academy and begin the journey to a deeper understanding of the meaning of positive peace. I wonder where it will lead? 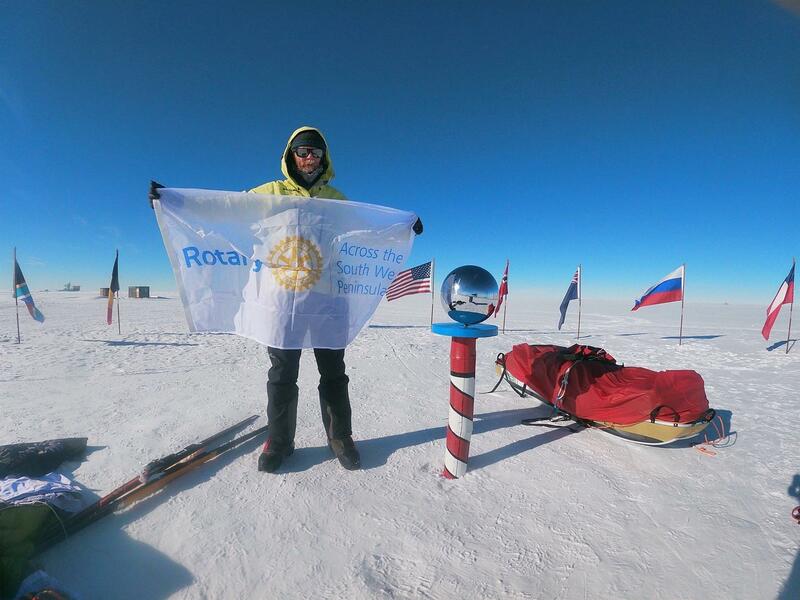 Former Royal Marine, Baz Gray, has just completed the first phase of an amazing Antarctic trek to the South Pole, and he has been partly sponsored by Rotary. Service Above Self and One Profits Most Who Serves Best, Rotary’s official mottoes, can be traced back to the early days of the organization. The Portland gathering also inspired the motto Service Above Self. During an outing on the Columbia River, Ben Collins, president of the Rotary Club of Minneapolis, Minnesota, USA, talked with Seattle Rotarian J.E. Pinkham about the proper way to organize a Rotary club, offering the principle his club had adopted: Service, Not Self. Pinkham invited Rotary founder Paul Harris, who also was on the trip, to join their conversation. Harris asked Collins to address the convention, and the phrase Service, Not Self was met with great enthusiasm. At the 1950 Rotary International Convention in Detroit, Michigan, USA, two slogans were formally approved as the official mottoes of Rotary: He Profits Most Who Serves Best and Service Above Self. 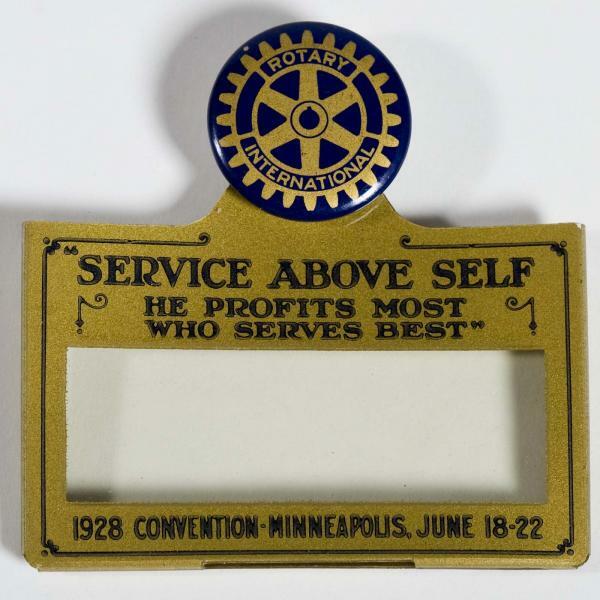 The 1989 Council on Legislation established Service Above Self as the principal motto of Rotary because it best conveys the philosophy of unselfish volunteer service. He Profits Most Who Serves Best was modified to They Profit Most Who Serve Best in 2004 and to its current wording, One Profits Most Who Serves Best, in 2010. 10th December as you are aware is celebrated as Human Right Day as well as conferment of Noble Peace prize to His Holiness the Dalai Lama. We celebrate this day as the conferment of Noble Peace Prize since 1989. This year is the 29th conferment of Noble Peace Prize to His Holiness the Dalai Lama.The day is a gazetted holiday day and our school actively participate in the celebration in the public celebration at the main temple of His Holiness the Dalai Lama. Central Tibetan Administration civil staff completing 25 years of service are publicly honored. We also have guest of honor from Indian Parliament. This year we had a team of Human Right Committee executive members from Congo. After formal speeches from our government there are series of cultural performances. This year our teaching staff took part for the performance as we do not want to disturb our students because of their upcoming annual examination. I have uploaded the performance by our staff. What Do You Do When You Have A Dream? There are many ways to carry out your dram or your vision. Here is just one of those stories and it's a local Upstate NY story too. It's about sense of purpose, perseverance, family and most of all love. So many people have ideas to do good in the world. Here's the real life story of a young woman who made her dream come true. Watch the video and then check out the Bakery for their recipe for success. It is also an excellent explanation of Autism and social enterprise. When I first saw these photos and read how the children of this Tibetan Children's Village school in India gathered to welcome visitors I realized that children everywhere and yes, perhaps schools most places welcome visitors in similar ways - flags, gifts, happy faces, lots of pictures, assemblies. So among our differences we can celebrate similarities as well. Thanks to EClub member, Phuntsok Namygal, Data Administrator of the school, for these lovely photos and our story of the week. TCV Welcomes US Congressional representative Lleana Rose Lehtinen and Rep. Claudia Tenney along with her team today in the afternoon. We are very happy to have them in the midst of our very innocent and loving children welcoming them with flags held high as they possibly can reach. A Note from Pep - This letter from our District Governor resonated with me because I also believe that Rotary is something you must experience, an emotional connection. For me it was a little 3rd grade girl who kissed the dictionary I gave her. That was my Rotary 'aha' moment. I carry that picture in my heart. For others it's the drop of polio vaccine or seeing a family take their first drink of clean water or watching a child put on a new warm winter coat. For others it's traveling to assist communities to build computer labs, or pioneering conservation projects and community development and for others it's moving us towards peace. Having just inducted two new members into our Rotary family I also feel responsible for helping them find the Truth of Rotary to enrich their lives. Have YOU had an 'aha' Rotary moment? Please share it on our November wall. Rotary International announces new partners. Does this expand our options for Service? Welcome to our Rotarian Visitors from Around the World! After spending roughly 30 minutes on the website, please fill out this form and send to our secretary Camilla Lake. She will forward the necessary documentation to your club secretary to credit attendance. Have you checked out our Flag Counter at the bottom of this page? Stop in and let us know where you are from. We are striving to be convenient and accessible while still living up to the highest ideals of Rotary. Please visit again soon!